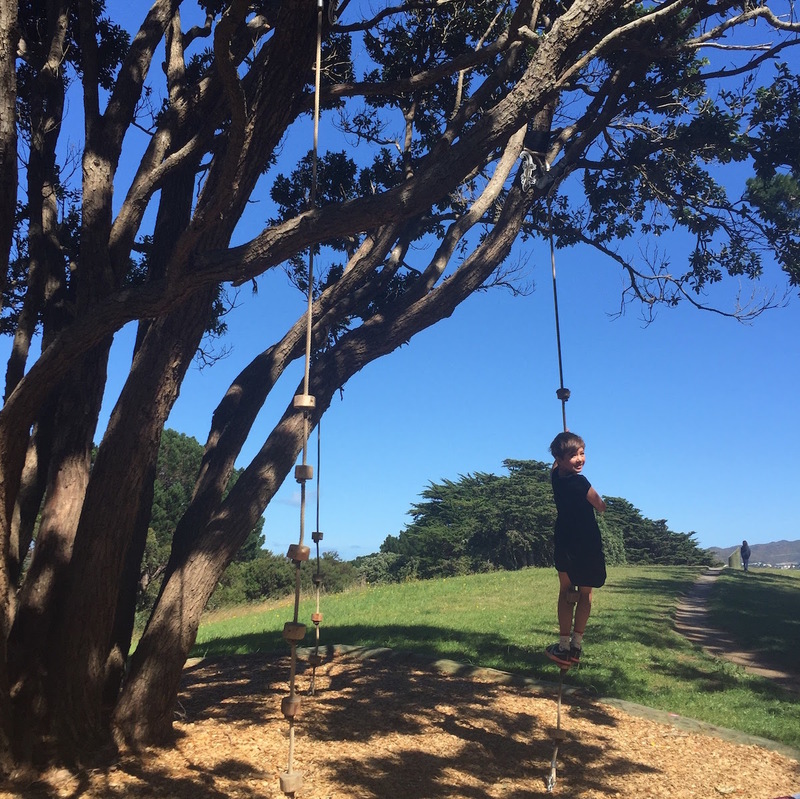 I first stumbled across the enticing play areas of the Matairangi Nature Trail, along the ridge line of Mt Victoria, on one of my long runs. 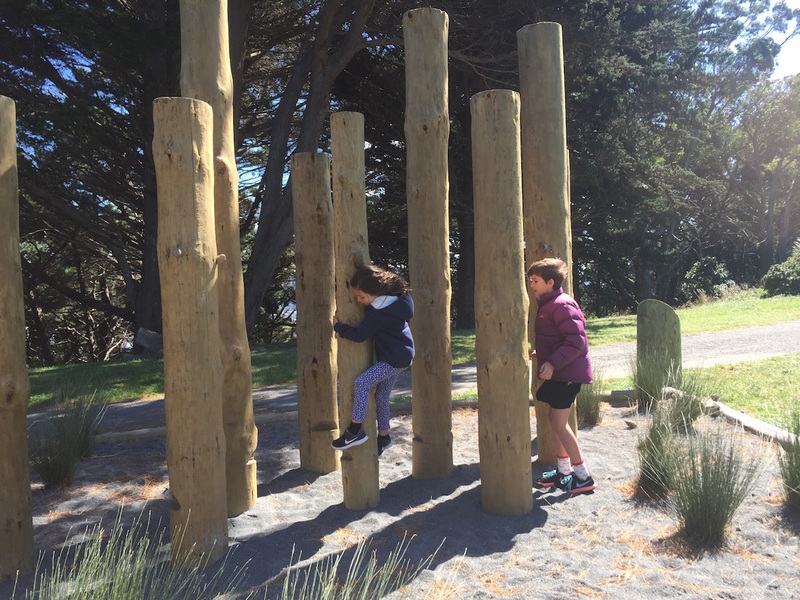 I couldn’t wait to grab an opportunity to bring my two youngest children to explore, climb and play. 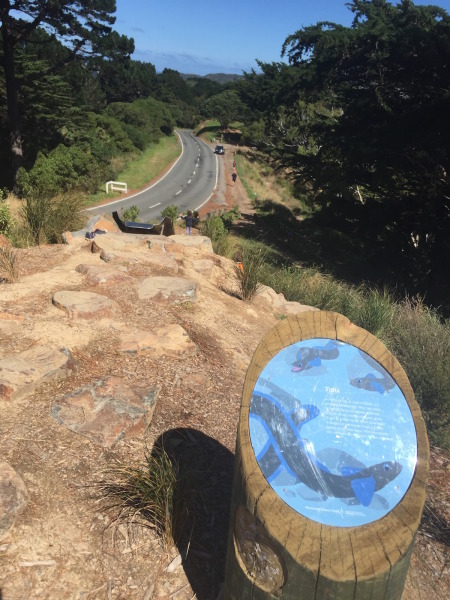 I’ve always loved walking and running the town belt trails of Wellington, and of course the Mt Victoria Lookout is high on the tourist visitor’s ‘must do’ activities. 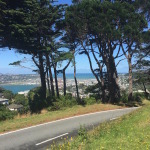 It’s an incredible place to get to grips with the geographically fascinating topography of Wellington, with its harbour, bays and peninsulas. For children it’s now been made extra special, with a nature trail designed to meet the heart of every child and their instinctive need to play. 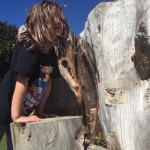 Looking for hidden flies, seeking them out just like a Kapokapowai / dragonfly. The play stations reflect elements of nature. 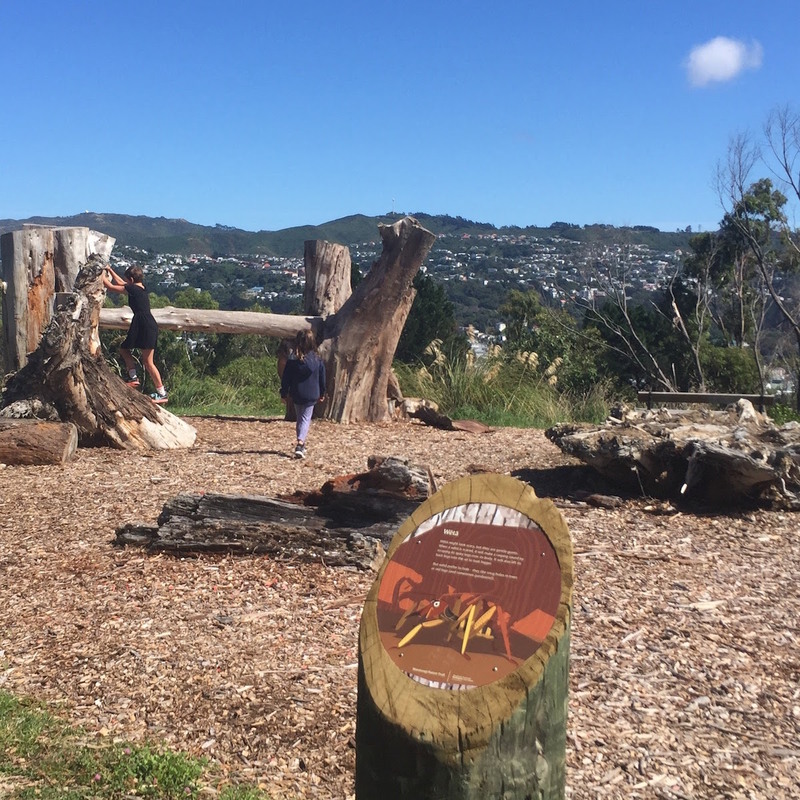 From the lookout the first play station is a slide, following the nature of a slippery fresh water eel – ‘Tuna’ in Maori. A cheeky fantail / Piwakawaka leads the way to each play station, which follow the ridge line of Mt Victoria. 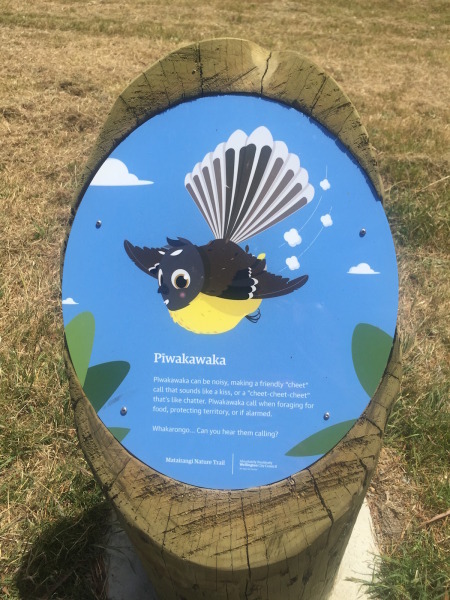 Follow the Piwakawaka along the nature trail! 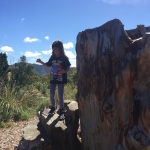 My girls loved climbing, balancing, jumping and searching for hidden nature signs – like the weta hidden amongst the tree trunks in the photo below. 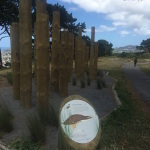 And balanced their way through a play station resembling wetlands, home to the matuku hūrepo – the endangered Australasian Bittern / Hūrepo, whilst I delighted in having the time to enjoy the beautiful views of the surrounding city. 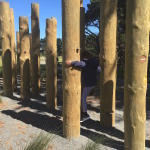 Weaving through the reed poles. The last play station we came to, as we followed the ridge-line, down from the lookout point of Mt Victoria, was a great one to finish with. 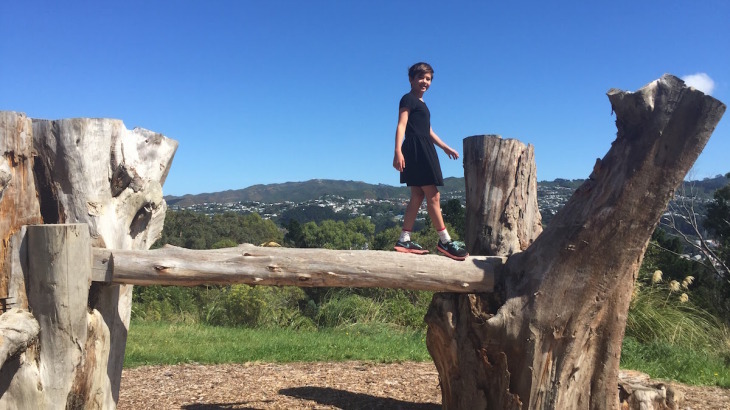 First we came to a tree trunk, placed like a bridge, leading the way down into a beautiful grassy glade, bordered by trees. 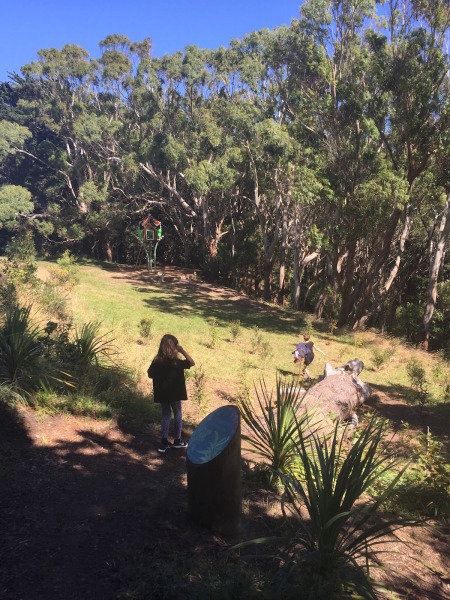 Then the girls spotted the tree house! 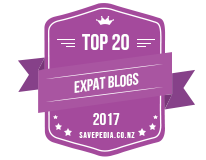 It didn’t take them long to reach the top, which gave them a bird’s eye view of the surrounding area, just like the NZ Falcon, the Karearea. 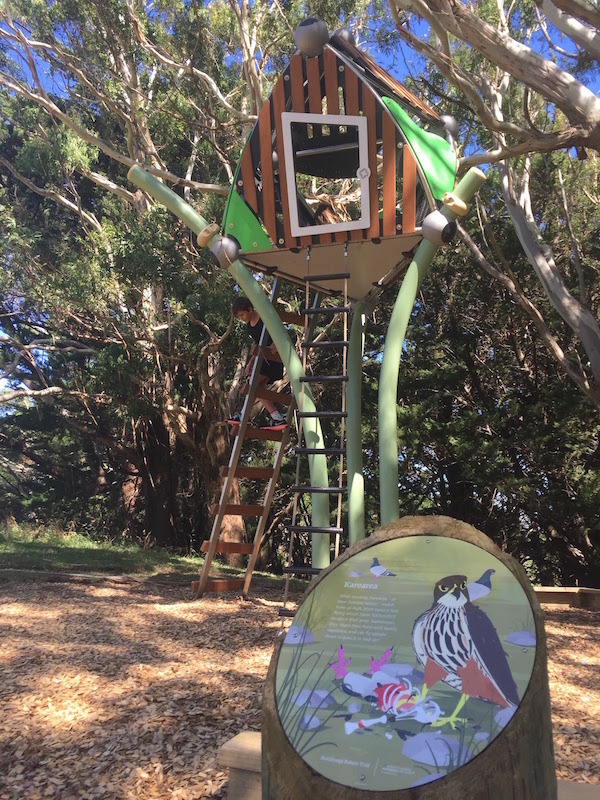 Climbing high, enjoying a bird’s eye view – just like the NZ Falcon, Karearea. 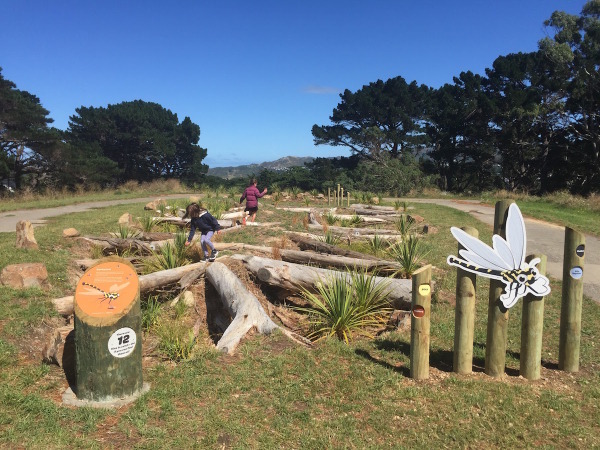 We really love this new nature trail and are very grateful to Wellington City Council for their vision and provision of places like this to inspire our children, give them opportunity to play and to appreciate New Zealand’s amazing nature. 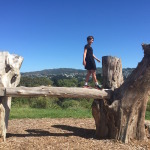 Country Kids, Header, Learning & growing, Playgrounds & Parks, Trails, Walks natural learning, nature, trails, walking, Wellington. permalink.